We have seen in first chapter how to setup the application, in this chapter we will see how to manage adverts. By default you will get a 20 adverts, when you call this url. The _format can be json or xml. By default it is set to json. You can make filters to retrieve adverts list. So to filter result, just add some parameters. in the next section, a description of available parameters. The response,by default is Json. You can use any JSON client to parse it. It shows you the links of the paginator. Using this links, you can browse results without building a new query for the same criterias. next: The URL of the next page. Data in “adverts” collection under “_embedded” section. It’s a normal Json content, so you can parse it using any Json Client. There is a special key under “_links” of categoryGroup and city keys which is “list“. If you have any question, please post it in the dedicated Forum Secion. Our API uses HTTP verbs and a RESTful endpoint structure. WSSE is used as the API Authorization protocol. Request and response payloads are formatted as JSON. To be able to use our API, you need to get a professional account. If you are not already registred in our plateform, you can register now. Now go to your member space and get your API KEY. Once you have loggend with your professional account, go to “Mes applications“, then create a new one. Simply, you will be asked for the name of your application. 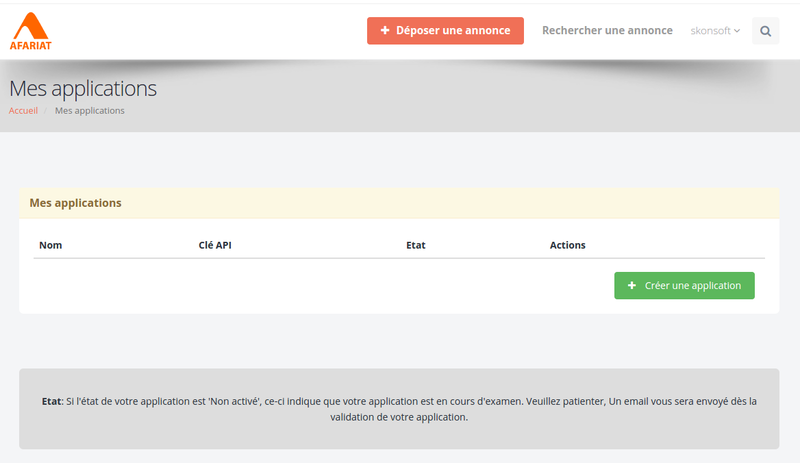 Now you should wait to activate your application by AFARIAT. You will recieve an email when it’s done. Here we suppose that you have already an application enabled. It should have exactly 64 caracters. Afariat Tayara is more than a simple website where users pubish their adverts. Here you will learn how to communicate with our platform. To facilitate communication with our plateform, we have developed two types of access.